Ever wanted to convert a picture into an spreadheet? Pictures are made up of pixels, millions of tiny dots that when combined create an imagine. 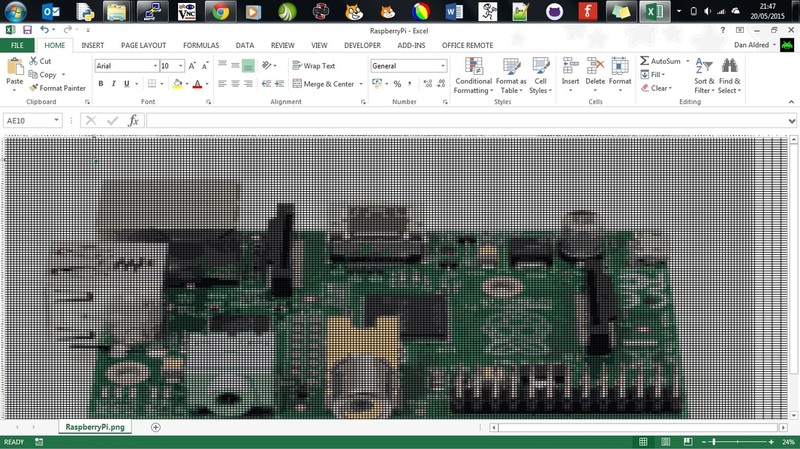 This program takes each pixel and identifies it's colour, then loads the spreadsheet program and plots out each pixel as a coloured cell. All the combined cells create the original image as a cool spreadsheet version. Next you will need a spreadsheet program to create the coloured cells. Libre office comes with a suitable spreadsheet package that can be used to for this purpose and can be easily installed, type: sudo apt-get install libreoffice-calc Once installed you are now ready to download the conversion program. Now all the modules are installed the next stage is to download the Image to Spreadsheet software, PNG to XLS. Click the link below and download the file, save it to the pi/home folder. You can run the program from any folder as long as this program png2xls.py and the PNG image to covert are in the same folder. where name_of_image.png is the name of the picture that you are going to convert, for example, sudo python png2xls.py libre Raspberry_Pi.png. 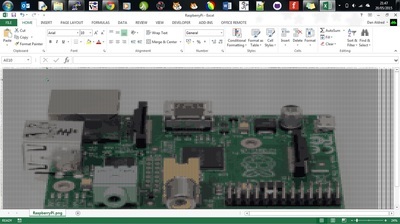 Once the program has finished it will have created a spreadsheet of the PNG image. You can use WinSCP or a similar program to transfer the spreadheet from the Pi to your computer,it is an open source free SFTP client and FTP client for Windows the main function is the secure file transfer between local and remote computer. A good extension to the hack is to add a USB Webcam, take a picture of yourself and then have the code convert it into your own self spreadsheet portrait. This uses the PyGame camera module to assess the web camera and save the photo. 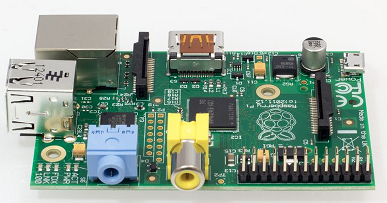 This already installed on the Raspberry Pi and can controlled with the code below. sudo python camera2xls.py libre photo.png Note that the image file is called photo.png and is the default name that the image file is saved as.